This heavenly lunch is a little smaller in portion size than my typical fair, but honestly, it tastes so good that a little goes a long way. Plus, it’s incredibly simple to make, and takes hardly any time at all. 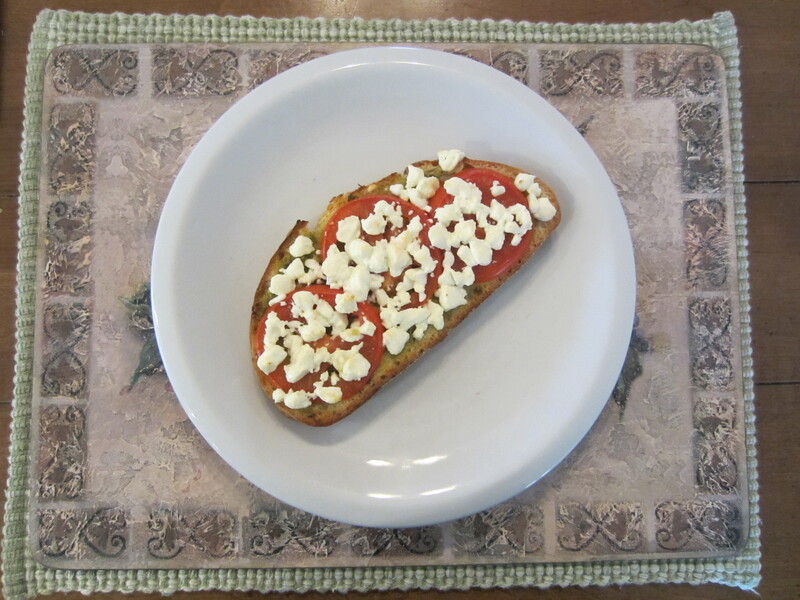 Spread pesto evenly on top of the bread, then lay tomato slices on top of pesto. Crumble goat cheese and sprinkle onto the tomato. Put in a toaster oven set at 415 degrees for 5 minutes. Jenny Craig: Works great as a lunch serving. If you miss the Jenny Craig Pesto Pizza, give this a try! The trick is in the ingredients. You want a good pane bread that’s about 140 calories a slice, with about 30g of carbs, 5g of fiber, and 6g of protein. That way, the bread is substantial. If you have a Costco nearby, I highly recommend their basil pesto. 1 tsp is about 28 calories and only 2.5g of fat. It’s also delicious. Otherwise, try to find a pesto that’s comparable (or even better) as far as calories and fat, but make sure you like the taste. The pesto really gives this panini it’s intensity. Goat cheese is pretty typically 80 calories an ounce, so unless you’re really particular, buy what’s on sale, because it can get pretty expensive if you’re not careful. I’m fairly certain that using a conventional oven for this recipe will work just fine using the given temperature and cook time. I haven’t tested this, however, so if you do try it, keep an eye on the panini. You want the goat cheese nice and warm, not burnt. But you also want the bread to be a little crispy. I do want to credit my sister Colleen and my brother Charlie for helping me with this. It was their idea in the first place…I just fine tuned the measurements to make it both healthy and satisfying. Charlie puts honey on his too, in case that interests you. Me, not so much. I don’t think it needs it. Besides, if I had 30 extra calories to use up, I’d just use more pesto! Yummy! Previous Previous post: We’re Finally in the Field!